The 'Psychological' aspect of No Longer Safe - what takes it from a suspense-mystery and turns it into a Psychological Thriller? 1. How did you get the inspiration for your new book No Longer Safe? AJ: I loved the idea of getting four people who appear to be friends, to meet up after a long break, but who actually create a toxic mix when they are left together. The circumstances of the remote location, making the group largely cut-off from civilisation and brewing in their own company gives a volatile ‘hotbed’ feel to the book. With lies, pretence, secrets and ulterior motives, I wanted to create a sense that anything could happen...and it does…and where the worst side of people’s personalities would start to come out. AJ: I think it can be either, but for me, mainly the character comes first and I’ll think ‘He or she could do X or Y, because of this dysfunctional aspect in their character’. Occasionally, I have a ‘condition’ or a disorder I’d like to explore and I’ll think ‘What kind of person would be managing this syndrome? How would they hide it?’ Then I play around with both the character and the disorder and find out who that person might be. In No Longer Safe, all the characters have mild psychological ‘issues’ from the start - Alice, the narrator, has low self-esteem, for example. It’s the events during the story, however, that trigger the main psychological impact for various figures in the story. In this way, the characters respond in certain ways as the story progresses, but what they do has to be latent from the start. The plot itself leads the psychological content, but the twists need to be borne out of the existing traits and qualities of the characters, although some of these behaviours and flaws are disguised. 3.What makes a Psychological Thriller? AJ: For me, the jeopardy in the story comes from the ‘inside-out’, rather than from the ‘outside-in’, so that the characters are exposed to danger on a mental level, rather than (or as well as!) a physical one. The plot usually centres around the hidden unreliability or instability of characters in the story, with tortuous situations threatening either themselves or others. This kind of mystery allows the reader to get right inside the minds of key players to try to anticipate how they might handle certain dilemmas and tempts the reader towards trying to figure out what the true motives are. In No Longer Safe, nothing is what it seems… There are twists and turns along the way, blindsiding the reader with actions and behaviours pulled out of the bag by various characters. A big shock at the end is pretty much de rigueur in psych thrillers. I love to knock my readers sideways – and there’s certainly a delicious sting in the tail in this novel! 4. Does each of the main characters in the novel have a psychological issue (whether mild or major)? Or is just the protagonist and the antagonist? AJ: I have a Trilogy – a series of three psychological thrillers coming out next! They all feature an intrepid (fictional) Clinical Psychologist, Samantha Willerby, who is based at a hospital in London. She faces extraordinary crimes hidden inside chilling mysteries that test her to the limit. The first book is called Inside the Whispers and is about several passengers who recount scenes from the same Tube disaster - an incident, she discovers, that they were never involved in. It’s due out in Autumn 2016! Huge thanks to Nada Adel Sobhi for this Interview, most of which appeared on her diverse and creative blog in February 2016, here. Not a Psychological Thriller (in my view) - but loved it, anyway! Wasn’t sure what to expect with this book. It has the same title as the excellent psychological thriller by Mary Kubica, so expectations were high. I wouldn’t describe it as a psychological thriller, but it’s a very good book. In particular, due to the way the characters and dialogue come to life making the reader feel like they are standing in the same room. That’s a rare gift! The story is about the changing dynamics within two families who end up as neighbours, with drama involving the youngest boy, right through to his going-off-the-rails grandfather. The individual characters and their traits are portrayed in beautiful detail and we are led through a whole whirlwind of emotions: humour, sadness, dread and sexual discoveries. I love having a book I can’t wait to get back to and this was it. 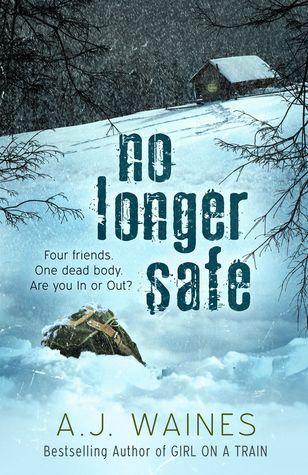 No Longer Safe - Launch Today & Giveaway! ‘…a disturbing psychological thriller that will resonate in your mind for many days to come. You will not forget this novel! See the individual links below for Reviews and the background to the book. Thanks to all these magnificent Bloggers for your support!